School administrators recently delivered a bit of good news to the Loudoun County School Board—they are seeing continued progress in closing the gap in how frequent minority students and students with disabilities are disciplined compared to their classmates. Asia Jones, assistant superintendent of Pupil Services, told the School Board earlier this month that, through what she called “restorative practices,” her team is working with school administrators and teachers to reduce students’ suspension rate, especially among minority students and those with disabilities. She reported that last year the suspension rate was 1.94 percent among black students, down significantly from six years earlier, when it was 4.36 percent. The suspension rate among Hispanic and white students also dropped during that six-year stretch, from 2.55 percent in 2011-2012 to 1.84 percent for Hispanic students, and from 1.24 percent for white students in 2011-2012 to 0.87 percent last school year. The rate has also dropped significantly among students with disabilities, from 5.71 percent in 2011-2012 to 0.74 percent last school year. “While the desired outcome is to continue to improve the overall suspension rate, there is much to be applauded in the intervention work that is happening to produce these results,” Jones said. The average number of suspension days is still higher for Hispanic students than the rest of their peers. Hispanic students were suspended an average of 4.22 days last year, while their black classmates were suspended on average of 3.76 percent and 3.84 percent for white students. Black and Hispanic students are also referred to the principal’s office much more frequently than their white classmates. Last year, it was at 17.27 percent among black students, 14.25 percent among Hispanic students, and 9.87 percent among white students. Jones said that the county’s unified mental health teams—which were established in the past couple of years—are helping to identify students who are frequently referred to the office for discipline problems. Then they work with principals and teachers to address the problem. In many cases, they offer teachers more support in the classroom or tailored professional development on classroom management. “We also work with principals to review the data as part of their school improvement plans and address those levels of disproportionality,” Jones said. She also noted that Loudoun County suspends its students much less frequently than other nearby school districts. 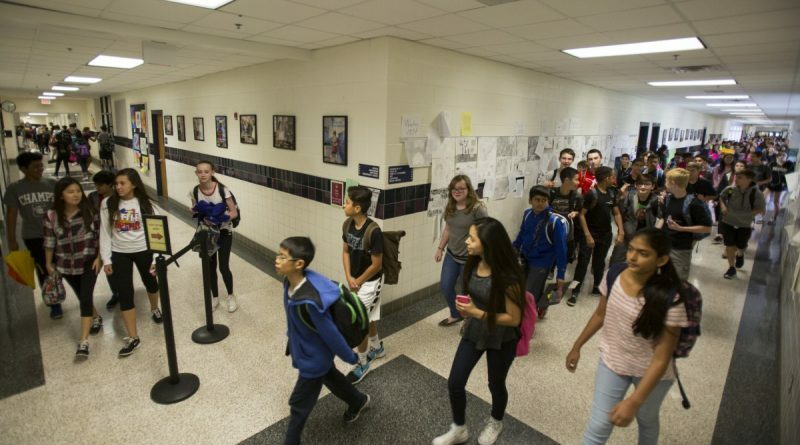 One percent of Loudoun’s 79,000 students faced suspension last year, as compared to 1.74 percent in Fairfax County and 3.5 percent in Prince William County. She pointed to the Positive Behavioral Interventions and Supports (PBIS) program that’s been introduced in every Loudoun school over the last few years. It helps educators create plans to prevent poor behavior, particularly for students who would benefit more from counseling than a week out of school. Several board members thanked Jones and her team for their work to find alternatives to out-of-school suspension. Several School Board members who were elected in 2011, including Rose, made improving the county’s discipline model one of their goals on the campaign trail. “This has personally been important for me,” Rose added. She asked Jones whether teachers or principals feel they cannot suspend a student when needed for fear of driving up the county’s rate. Joy Maloney (Broad Run) pointed out that the school system has work to do in improving the disproportionality rates, especially among Hispanic students. Wendy Caudle Hodge, president of the Minority Student Achievement Advisory Council, said she’s happy to see the rates improve but she wants to see more progress made. “The individual students are not see the progress, they’re not feeling the progress,” she said. The school division’s administration team has also identified that as a goal. The superintendent’s proposed budget earmarks $200,000 to create a new position, equity and cultural competence specialist, and fund the development of equity and cultural competence curriculum.